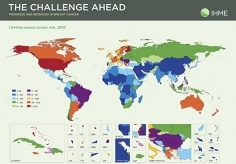 The IHME policy report The Challenge Ahead: Progress and Setbacks in Breast and Cervical Cancer outlines global, regional, and country trends in cancer cases, deaths, and risks over the past three decades. 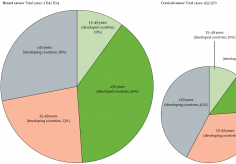 This is the first global assessment of country-specific trends in breast and cervical cancer for all countries by age, and the findings were simultaneously published in The Lancet on September 14, 2011. The research shows the number of cases and deaths from breast and cervical cancer are rising in most countries, especially in the developing world where more women are dying at younger ages. For breast cancer, cases more than doubled around the world in just three decades, a pace that far exceeds global population growth. During the same period, breast cancer deaths increased at a slower rate than cases, reducing the risk of death for women in developed countries, and indicating that screening and treatment programs are having an impact. On the other hand, cervical cancer cases and deaths increased overall at nearly the same pace, with 76% of new cases occurring in developing regions. If current trends continue, within the next two decades women under 50 will die as often from breast and cervical cancer as from maternal causes in developing countries. Given these trends, the report lays out recommendations for policymakers, including gathering more data through expanded cancer registries, implementing new techniques in verbal autopsy where countries lack vital registration systems, conducting further studies on health policies to understand why the progress in some countries is not shared by others, and implementing further cancer control strategies. The work was funded by Susan G. Komen for the Cure. *Software capable of displaying a PDF is required for viewing or printing this document. You may download a free copy of Adobe Reader from the Adobe website athttp://www.adobe.com/products/acrobat/readstep2.html. Institute for Health Metrics and Evaluation. The Challenge Ahead: Progress and setbacks in breast and cervical cancer. Seattle, WA: IHME, 2011.